Aria the Scarlet Ammo (Hidan no Aria). I feel so bad for this show. It wears its heart on its sleeve, and it gets dismissed for being just what it is. Have you ever enjoyed some delicious food, only to have your dinner companion say some restaurant that closed down made the same dish better? Or you stumble out of a movie theater, your heart still racing from the events you witnessed on the big screen, when your friend turns to you and says, “It wasn’t as good as the book.” I’ve been that friend; I’ve laughed at someone fangasming over a song that was “just” a cover of a song by a band I had been listening to for years. Girls with guns? We've got that. I’ve seen threads on the ‘Net asking what show is best for introducing people to anime. At least half the people commenting seem to think that new people shouldn’t be admitted into fandom without watching the original — the show that introduced super robots, or harem comedies, or defined the mahou shoujou genre. But what if we’re wrong? What if the best intro to modern anime is just an enjoyable show, that looks good. Maybe potential fans don’t care if a particular character type has been done a hundred times before? The Miko (shinto temple maiden). If it ain't broke, don't fix it. Aria the Scarlet Ammo (Hidan no Aria) has been panned for being derivative. It is full of anime cliches, and doesn’t try to cleverly deconstruct them. I wrote before about the Genre-mashup genre, but this isn’t it. Here anime conventions like harem hijinx, girls with guns, and a reluctant hero, whose genetic makeup makes him awesome under specific circumstances, are played straight. This might disappoint those who have seen it all, but newcomers to anime can enjoy it for what it is. Oh GOD no. 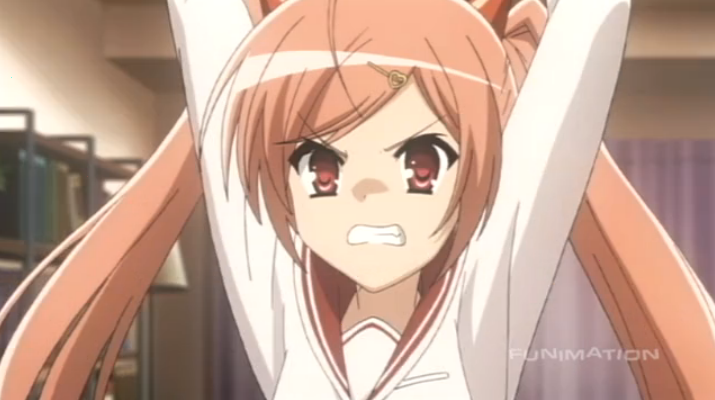 Not another Kugimiya Rie tsundere!? When will they ever stop!? Psgels watches a lot of anime. He has seen the original. Maybe YOU have seen this character before too, but is it really that bad for someone new to laugh at an old joke? I taught my 7 year old niece this one just last week: “Is your refrigerator running?” Yes. “Then you better catch it before it gets away!” Har har har. Is that it? a bundle of tropes? No. 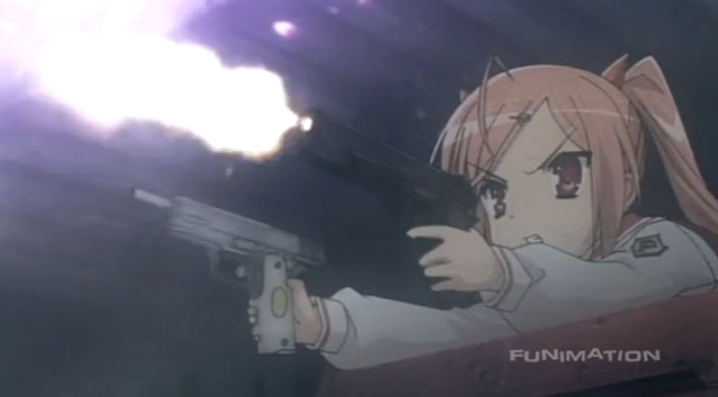 Aria the Scarlet Ammo actually has some decent action, and nice background music. The animation production studio is J.C. Staff. There are those that have said, this is just J.C. Staff doing the same show they always do, but the fact is, these are the guys who know how to do this kind of thing right. The character designs are good, the background artwork looks good, and they lined up a great cast. Honestly, if this show had come out twenty years ago, it would be hailed as a masterpiece. Looking for that first show to introduce a friend to anime? 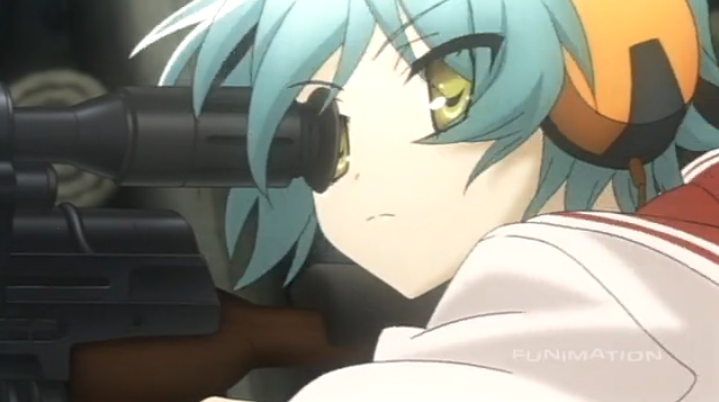 Introduce them to Aria the Scarlet Ammo, which is streaming by Funimation on Hulu. And for those of you who have already seen the original, approach the show with a beginner’s mind; you just might have a little fun. Oh, yeah. This guy is in it, too. It certainly is going to be a novelty for the person who hasn’t really watched anime much, that’s a given. They just haven’t watched something similar before. But I guess Psgels has a point in that, for all the rest of us that have watched boatloads of anime, it’s overdone. Yeah, I guess the more anime one watches the more difficult it is to find something fresh to enjoy. But even if we sit back and grouse, there’s no need to deny a new generation the thrill of discovering something for themselves. This is probably one of my many guilty pleasure shows of the season! Yes the story and plot are crap and not really original, but I don’t mind to much! Yes Aria is a straight up clone of every character Rie has done in the past. But that wont stop me from watching hahah this is mindless fun for me! 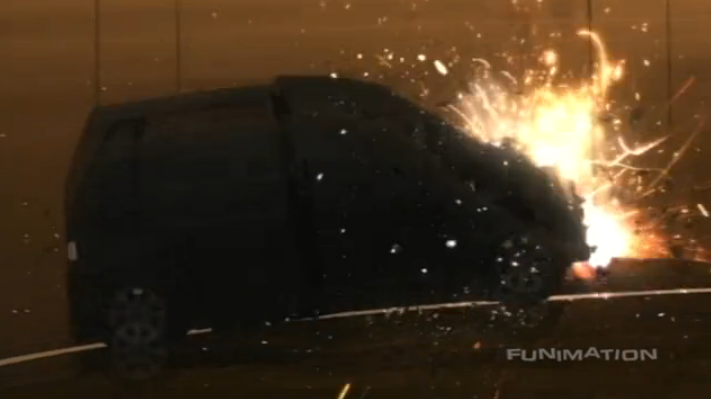 And yes stuff blows up! Which I love. Exactly, it may not be original, but it is fun. That doesn’t mean everybody HAS to watch it. And it is okay to like something better, but objectively it isn’t any worse than any of the other shows that are like this. There certainly is worse to watch this season. From the perspective of a newcomer, maybe this would be an interesting series to start off with. Honestly speaking, though, I feel that this series would be a poor series to start with because of some of the blatant fanservice and some rather gaping logic flaws in some of the arcs. This series is a bit too niche to use as an intro series, with more mainstream series a much better fit for the task (Nodame Cantabile, Death note, etc). Perhaps as an “intro to the harem genre” series this could work, but I could easily suggest some of the other works Rie Kugimiya has been involved with over Hidan no aria, such as Shakugan no Shana, Toradora, and heck, even Zero no Tsukaima (1st season). Well, here is one huge advantage Aria the Scarlet Ammo has over some (all?) of the shows you mentioned: it is available on Hulu, so people can watch it the same way they watch 30 Rock, or whatever. I wish someone would publish Nodame Cantabile on DVD! I want a copy of that for myself. The first season was excellent, and I tried to get some non-anime viewers to watch that before, but then I have to try to set them up with copies of the episodes. You can’t expect someone to learn how to navigate the world of fansubs on their own when they aren’t sure they will like it. 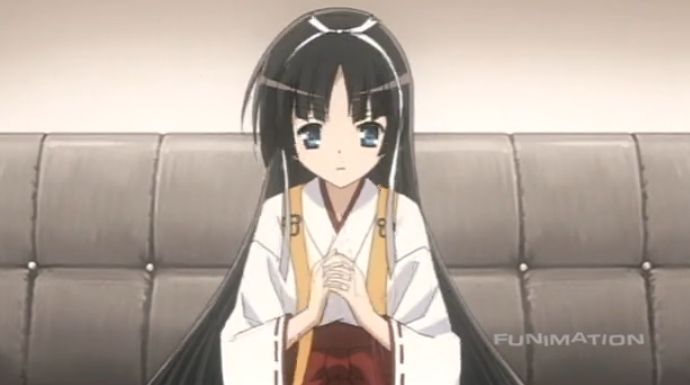 As for Shana, etc. that was my point about the original. Obviously I’m not going to tell people to NOT watch Toradora, but if they can’t (or simply don’t), and they watch Hidan no Aria, and have a good time, it’s all good. Meh, I think that there are better choices than Aria even in the overused harem action genre. For instance, Index. I find the whole premise of Aria downright campy. Mercenary schools? Bullet-proof uniforms? A guy who becomes James Bond when he is turned on? Please. Even a newcomer should feel insulted by this show. Campy? Yeah, I can agree with that. But you really think a mercenary school is less plausible than the setting for Index? At any rate people need to get used to silly ideas (robot maids? vampire ninjas? Gender-bent Chinese warlords?) if they are going to watch anime. I think even those who are not familiar w/ anime could be disappointed with this series. Putting aside the cliches, the plot really FAILS. I honestly won’t ever recommend this as an intro to anime newbies, it gives anime a bad image. Much more to those who are more used to novels, many of them are stricter when it comes to plot and character development. Whether you’ve seen a lot of anime or not, as long as you just watch it for fun, that’s the only way you can appreciate it. Well, that’s just my opinion. Well, I’m not going to try to argue that the plot or character development is better than in novels or even better than any other anime. My point really wasn’t that this is the BEST anime, but rather that people can see what a modern anime is like. Honestly of the 30 or so anime that broadcast this season, I would be surprised to hear that this one fell into the bottom half for plot or characterization. I also think you should consider what you are trying to entice people away from. There are a lot of great novels out there, but there are many people that aren’t reading them. What about people who are used to watching “reality” like the Real Housewives, or something? Can you really say that Jersey Shore has better plot and character development than Hidan no Aria? If people are reading a good book, maybe we should just let them be. 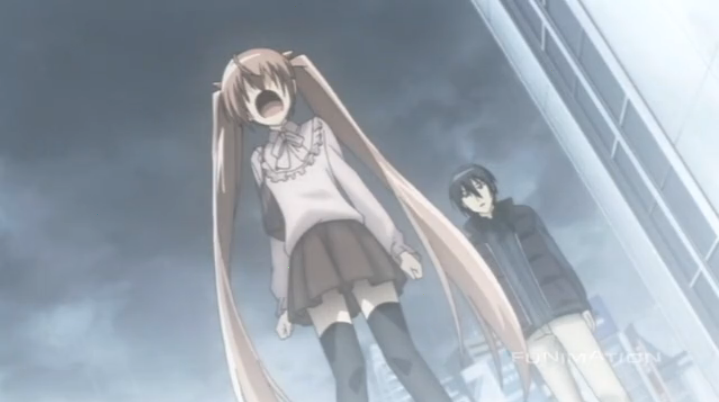 = I get your point, and this series is indeed a very nice example to show what modern anime is like…. particularly on the generic modern anime. That’s why I said it would just give the recent anime a “bad image” x_x So if for example someone used to watching other types of media (reality tv, drama, etc.) 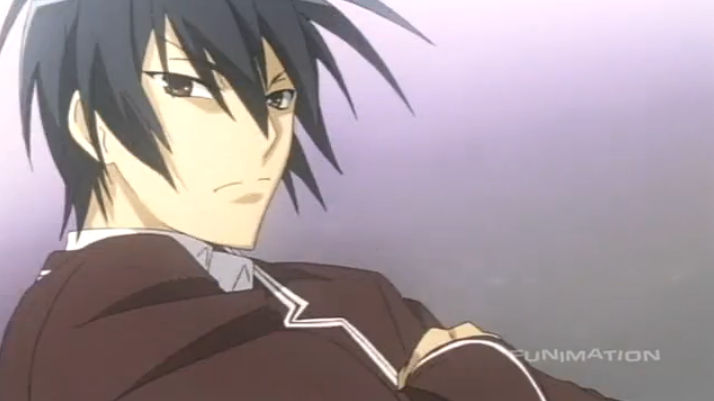 watch Aria as their first anime AND they’re not going to watch it just for fun… disappointment’s gonna start very early. But ah well, “one man’s trash is another’s gold”. Maybe there’s actually something remarkable in this series’ story, but I just don’t see it. = Hmm… that’s true. I take back what I said about novel readers being “stricter” to plot. I just recalled that there are some novel readers who also read for…. fanservice. Fair enough, and probably all for the best. Perhaps, but that is kind of a negative way of looking at it. Think of it this way: if they did start watching anime with something mediocre like this, you can legitimately say, “well, if you enjoyed that, here are some truly excellent shows …”. In the past, I tended to say, here is the best show (Haibane Renmei, which is original, has a great plot, and TRUE character development), but the problem with that is you have to be receptive to it. People usually receive it like it is medicine; they take one sip and say they aren’t really that sick. Another of my favorite shows is 12 Kingdoms. Again we have TRUE character development, but the resulting problem is that the characters start off very unlikeable. if someone isn’t willing to stick with it, despite the fact that the characters are unlikeable, they won’t get a chance to witness their remarkable growth. Well, I guess the way I think about it is that the average of anything is average. I don’t really expect every show I watch to blow my mind. I try my best to avoid utter garbage, and I search out the rare gems, but I still expect to see a lot of average (or run of the mill) shows, because that is what is common by definition. If I stopped watching anime, I could avoid a lot more average stuff, but I would also miss the occasional gem. I enjoy finding those gems, so I have chosen to embrace the process of sifting through the average shows. For whatever reason this show was disliked by a lot of vocal people. Honestly, I have a difficult time seeing why this show should be considered worse than many other shows that come out each season. As you say, the animation style was decent, and if you like romantic/action/comedy then it is another one of these shows. How people can claim this show is bad, and then watch Dog Days, etc. is beyond me. If you hate romantic/comedy/action avoid this. If you want to see something fresh, well that is going to be the unusual show in any season — maybe the unusual show in any given year. Most of what we get are genre pieces. I happen to think Hidan no Aria (Aria the Scarlett Ammo) is a decent (not the greatest, but a decent) example of the romantic/comedy/action genre.